Job vacancy: Unique opportunity to join Koi business in Dubai! Experience in Koi health and acclimatisation after shipping. Be responsible for the well being of all Koi stocks. Be experienced in all aspects of Koi husbandry. Have knowledge of EA and OASE filtration systems. Be able to carry out installation work on new pond builds. Train staff on all of the above. One month paid holiday per annum. One paid flight to and from Dubai. A competitive salary based on level of experience. Charterhouse Aquatics is looking for hard working individuals to join its warehouse team at its brand new Hertford based distribution centre. The ideal candidate will have a keen interest in aquatics and previous warehouse or distribution experience. Full training will be given. We are looking for extremely hard working, highly motivated and punctual individuals. You will be expected to work as part of our current warehouse team but also be confident when working alone and meeting personal targets. Ensuring the warehouse environment is kept tidy and is a safe working environment. This is a fantastic opportunity to become part of a young and innovative team which is growing every day. We are continually taking on new projects, all of which are very unique. A position for a full time Sales Assistant has become available in our store in Weybridge, Surrey. We believe that our Sales Assistants are the most important ambassadors for our stores and for the hobby of fishkeeping, so it takes a friendly, knowledgeable and energetic person to ensure that our customers have the best possible experience. Someone like you — to greet our customers as they walk in, provide solutions and answers to their questions, and make sure they walk out with everything they need. Application deadline May 15, 2017. Click here to find out more about the role, what Maidenhead Aquatics are looking for and how to apply. Find out what other career opportunities are available with Maidenhead Aquatics at: https://fishkeeper.co.uk/jobs. Check out the latest job vacancies at Maidenhead Aquatics. The UK's leading aquatic shop chain, Maidenhead Aquatics, has a fantastic opportunity for an ambitious individual to create and develop a new online business, based at the company's Head Office in Egham, Surrey. This is a broad role encompassing the development of e-commerce and analytical platforms, team management, liaison with suppliers and senior management, all whilst providing the highest level of customer service. The ideal candidate will be a hands-on and social person with relevant managerial e-commerce experience. Click here to find out more about the role, what Maidenhead Aquatics are looking for and how to apply. A full-time job has become available in the new aquatics department at Hornsea Garden Centre in Yorkshire. Hornsea Garden Centre is one of the largest centres in the British Garden Centres family. Located in beautiful surroundings near Hornsea, it has recently seen the addition of a new restaurant and a huge development making it a destination garden centre. Hornsea now boasts a new aquatics department as part of the development, stocking marine, tropical and coldwater fish and accessories, and offering expert advice to help customers get the most out of their aquarium or pond. We are looking for a passionate and motivated full-time Aquatics Department Manager to continue the development of this department. Previous experience as a retail manager within the aquatics industry is preferred, however, applicants with a proven management background with a knowledge of fish keeping will be considered. Accountable for the operational excellence and financial performance of your department. Ensuring the highest standards of display, compliance and livestock inventory control are maintained and that sales revenue targets are achieved and exceeded. An inspirational leader for your new team ensuring that they receive clear direction and performance management within a culture of coaching and mentoring. Highly commercial and results driven with a proven track record in a management position. A positive and strong communicator and a skilled motivational people manager. Adept at succession planning and performance management. Accountable for providing great customer service and have a keen eye for detail around the consumer's experience in your department. A solution orientated thinker with excellent problem solving skills. Maintain standards of cleanliness and biological health of livestock holding systems. Responding to customer needs with expert advice and providing excellent customer service. If you are looking for new challenges within a forward thinking family run business and would enjoy the rewards this role would bring then we would like to hear from you. OASE are the worldwide market leaders in Water Gardening and pride themselves on their exciting, innovative and market leading products. In the last year OASE has expanded into the Drainage, Irrigation and Indoor Aquatics markets; including the acquisition of biOrb. This role requires a great deal of flexibility as no two days are the same. A willingness to learn is essential; as is enthusiasm. You will need to have a keen interest in ponds or aquariums and a desire to provide excellent customer service every day. The role is based at the OASE offices in Andover in Hampshire so the successful applicant will need to able to travel there each day or relocate to the area. A full driving license is essential. At OASE we have a very friendly team who are widely regarded as the best in the industry. To join us in the next stage of our growth please contact Amanda Crook, Sales Office Manager at a.crook@oase-livingwater.com with CV and covering letter. Online aquatic supplier Aquacadabra has a vacancy on its team. Aquacadabra is looking for a hard-working, friendly and enthusiastic Customer Service Advisor. This role would suit someone with previous experience who is driven and wants to do well in the business. Starting salary: £18,000 depending on experience, and commitment could lead to a much higher salary. Hours: Monday–Friday 8.30am–5.30pm and possibly some Saturdays (if so, there will be a day off in the week). Aquacadabra is the country's leading online aquatic supplier. We specialise in all aspects of the hobby from marines to tropical to coldwater and pond fish. We sell a huge range of products on our own websites, ebay and Amazon. Excellent customer service and administration skills. Excellent grammar and telephone manner. Experience of using online payment processing. Basic computer skills, especially Microsoft Office and Excel. Facilitate customer service telephone lines. Corresponding with customers via email and our support portal. Liaising with courier and supply companies. Fishkeeping knowledge is an advantage but not essential, the right person will be trained. Knowledge of Ebay, Amazon and websites an advantage. 13 Optima Park, Thames Road, Crayford, DA1 4QX. We are looking for a self-motivated individual to work in our East London office. 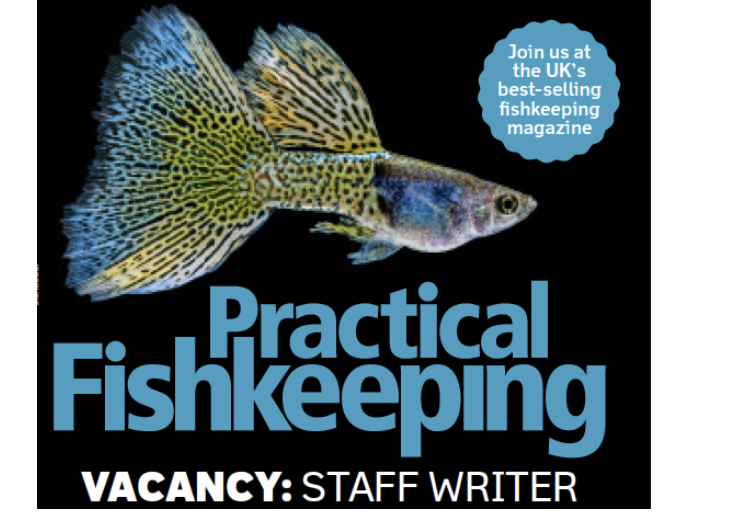 The ideal candidate will have previous customer service and front of house experience, knowledge of fishkeeping would helpful but is not essential. You will be expected to work closely with the rest of the team but also be comfortable working alone. We are looking for an experienced and hardworking warehouse manager who will be in charge of monitoring, coordinating and planning all aspects of our East London warehouse. Fishkeeping knowledge is preferred but not essential. Maintaining standards of Health and Safety, hygiene and security in the warehouse. The ideal candidate will have previous management experience and be used to working in a deadline driven environment. The successful candidate will be extremely hard working, highly motivated and punctual. The ideal candidate will have previous warehouse or distribution experience but full training will be given. We are looking for extremely hard working, highly motivated and punctual individuals. You will be expected to work as part of our current warehouse team but also be confident when working alone and meeting personal targets. Salary: Dependent on experience and suitability to the job role.